I am now beginning my third week as an Intern here at the conservation studio, and thought I would take the time to briefly introduce myself and the project. I am a current student at the University, studying for an MSc in Book History and Material Culture. The opportunities provided through this degree since it’s commencement in September have allowed me to realise fully a long-held belief in the irreplaceable importance of cultural heritage, and I soon wanted to get involved and gain experience in the field of conservation. As such, I have been a volunteer in the conservation studio since January, and when the advert for this internship was brought to my attention, I jumped at the chance. 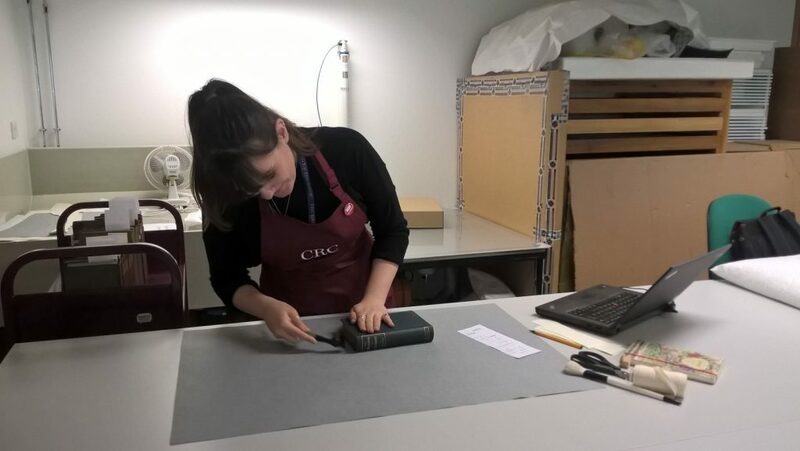 The Collections Rationalisation Project was devised by the rare books team at the CRC in order to process a large backlog of un-accessioned printed books and pamphlets, whilst simultaneously offering learning experience in archival management, collections research, and basic conservation. The CRC offered three internships as part of this project; two collections management interns to sort the books, determine any potential research value, and select which are suitable for addition to the University’s Collections, and one conservation intern – me! My job over the course of the internship will be to first surface clean those books which are selected for retention, and then – time allowing – move on to carrying out further conservation tasks on the books, such as tear repair, consolidation, and board reattachment. After only two weeks, I have cleaned 1,025 books; that perhaps gives some idea of the scale of the project, and the sheer amount of books we’re working with! I’m looking forward to experiencing the day-to-day realities of working in a conservation studio, and to learning new skills within this field. 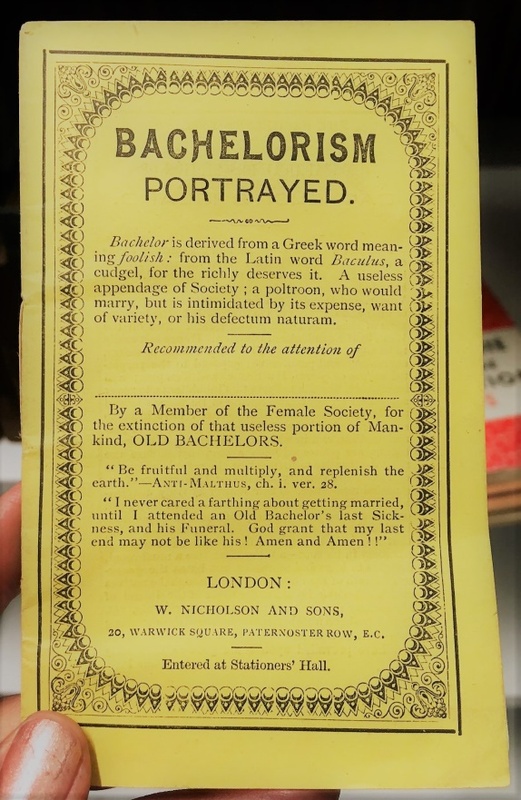 It’s also been and will continue to be great fun to see what kind of material we’re dealing with, and I’ll end with my favourite item encountered so far: a palm-sized, nineteenth-century pamphlet denouncing the defected nature of “that useless portion of mankind”, old bachelors! 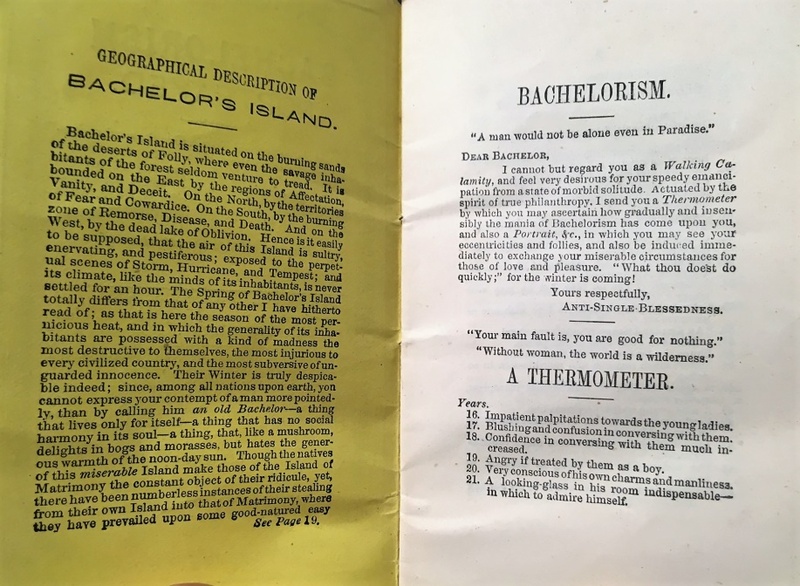 This entry was posted in Internships and tagged books, collection rationalisation, conservation, surface cleaning by conservation. Bookmark the permalink.